Singapore is a city where food is the star and the priority. 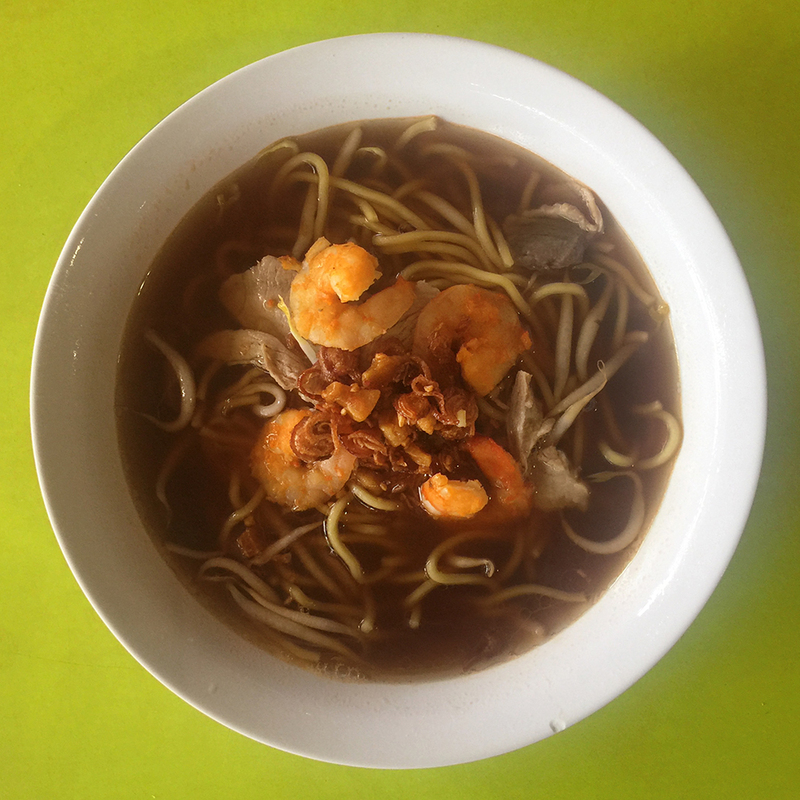 The melding of Chinese, Malay, Indian and Western influence makes the local cuisine uniquely Singaporean. I came to eat it all up. And eat I did. 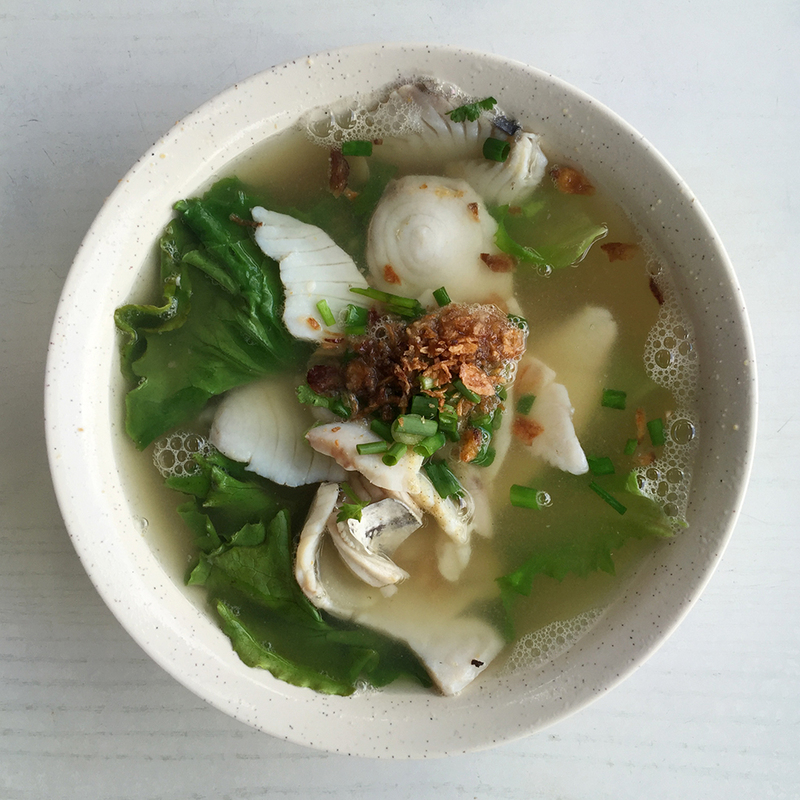 Sharing some of my favorite bowls and plates from my first trip to Lion City. When you go bring your appetite and excitement for an excellent eating adventure. The prawn noodles had a smooth broth with a nice prawn punch to it. The base was slightly sweet, the noodles had a nice chew to them and the prawns were tasty. The crunchy bits sprinkled on top added a nice texture too. 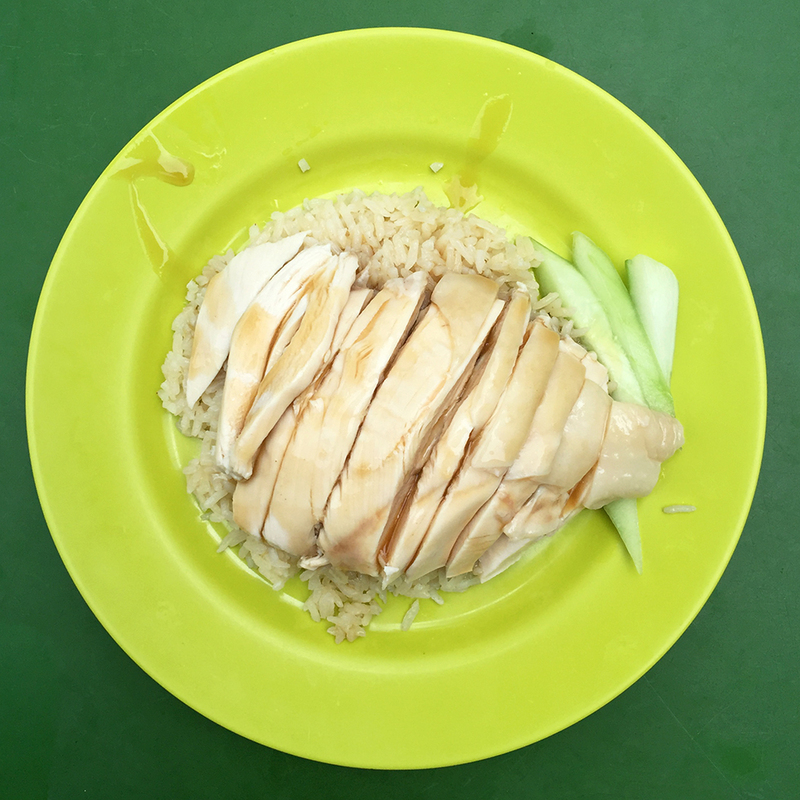 The general approach for travelers winging it in Singapore hawker centers is to just jump in the longest queue which Lee Hong Kee had. Grabbed myself a helping of duck with rice which was tasty. The duck and especially the sauce made for a nice and light afternoon snack. The rice was fluffy and very flavorful. The chicken was super moist and paired well with the dipping sauce and pickled, sweet and spicy cucumber garnish. 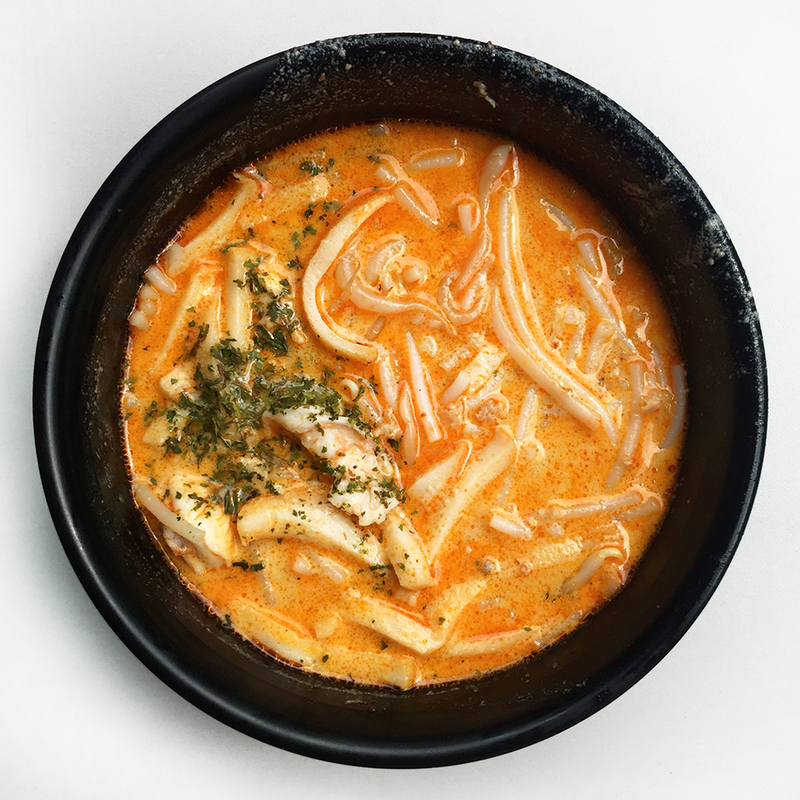 I had never heard of this Malaysian style noodle soup in spicy coconut curry broth. 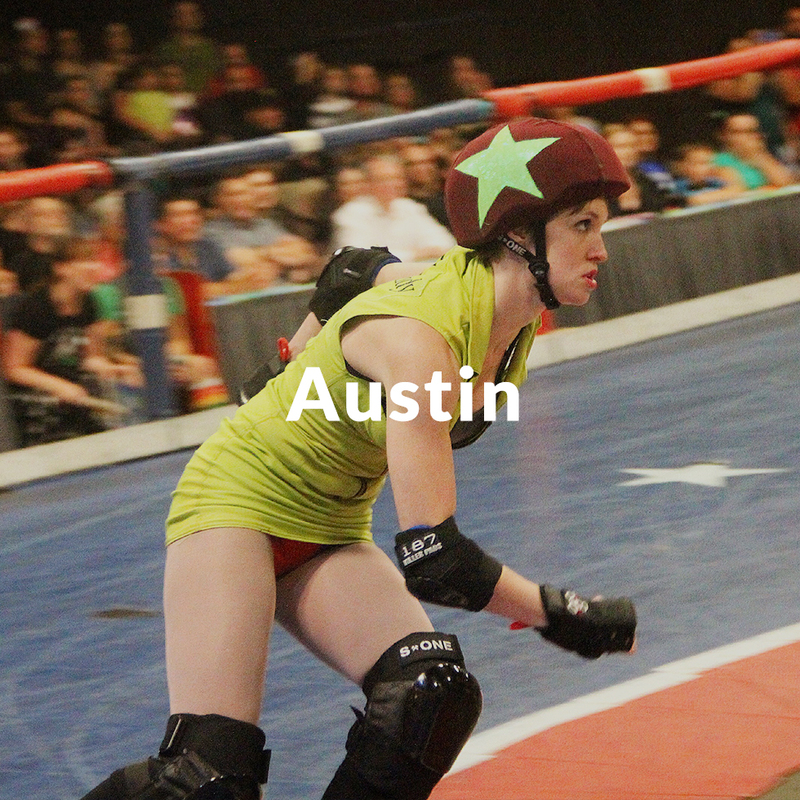 But it was real, real good. What's not to love really? Coconut, curry, vermicelli noodles, spice and seafood. I think most are after the rice here. It's cooked with the chicken so it absorbs the fat and flavor. The rice also has added aromatics that make it really, really tasty. 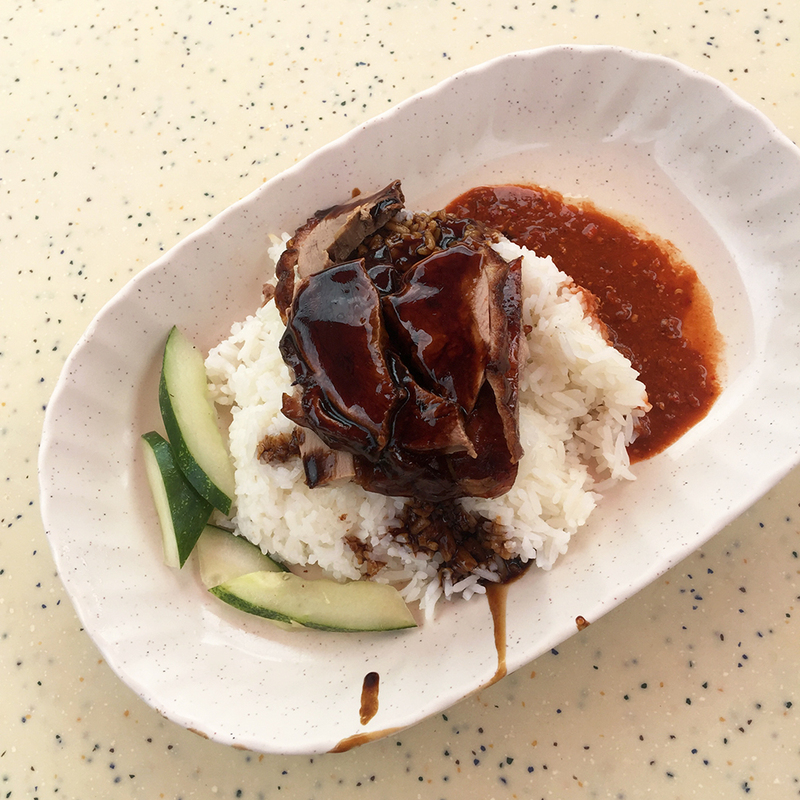 It doesn't have the really bold flavor profile of most dishes Singapore is known for. But it was a really nice bowl of soup with a very light broth, perfectly cooked fish and greens on a bed of vermicelli rice noodles. 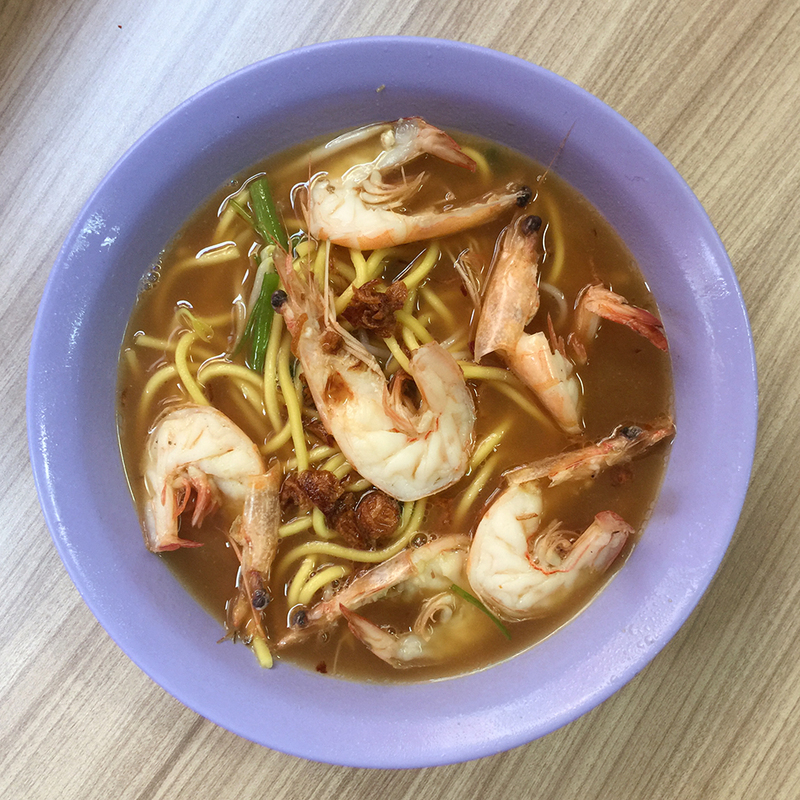 Blanco Court Prawn Mee is next to the Sultan Mosque and is where I had an early breakfast two of the mornings in Singapore. The broth was light, sweet and full of prawn flavor. The noodles were eggy and had a nice bite to them. Will definitely return on my next visit. This was a breakfast first for sure and may have been my favorite meal on my trip to Singapore. 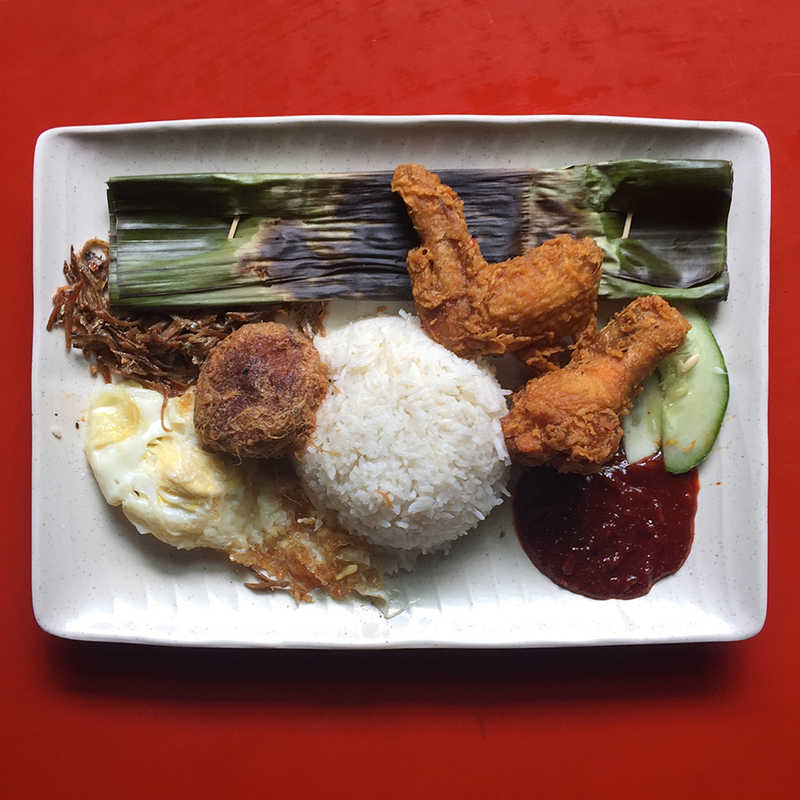 It was comprised of coconut rice, fried chicken wings, cucumber, sambal sauce, dried, fried sardines, fried egg, otah (fish cake grilled in a banana leaf) and a begedil (deep fried potato patty). The mix of textures and tastes were fabulous. 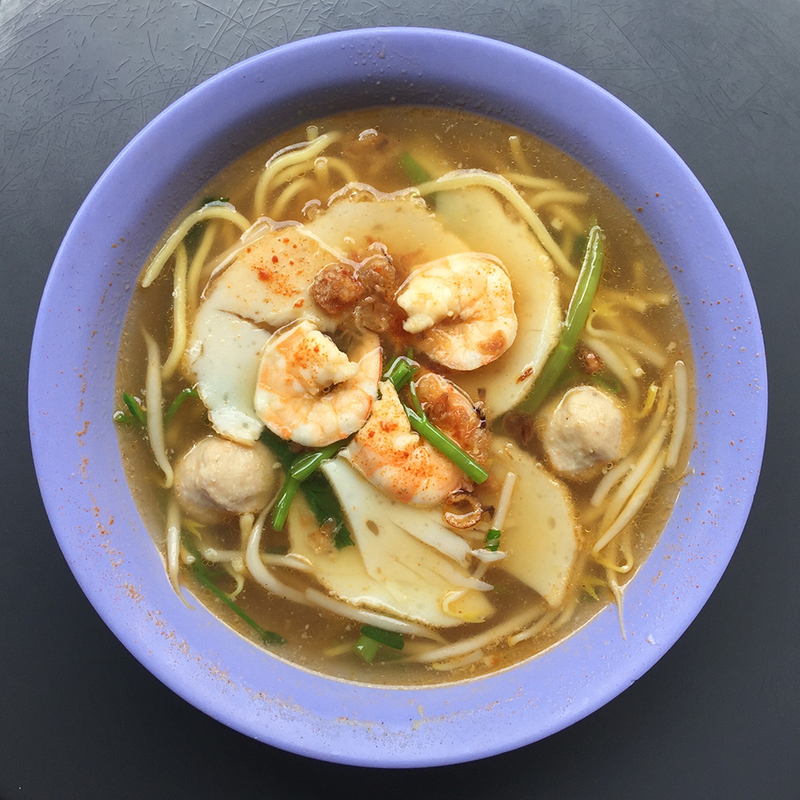 This stall serves up a meaty prawn noodle stuffed with lots of goodies: prawns, fish cakes, fish balls and green onion all resting on a bed of noodles in a light broth. 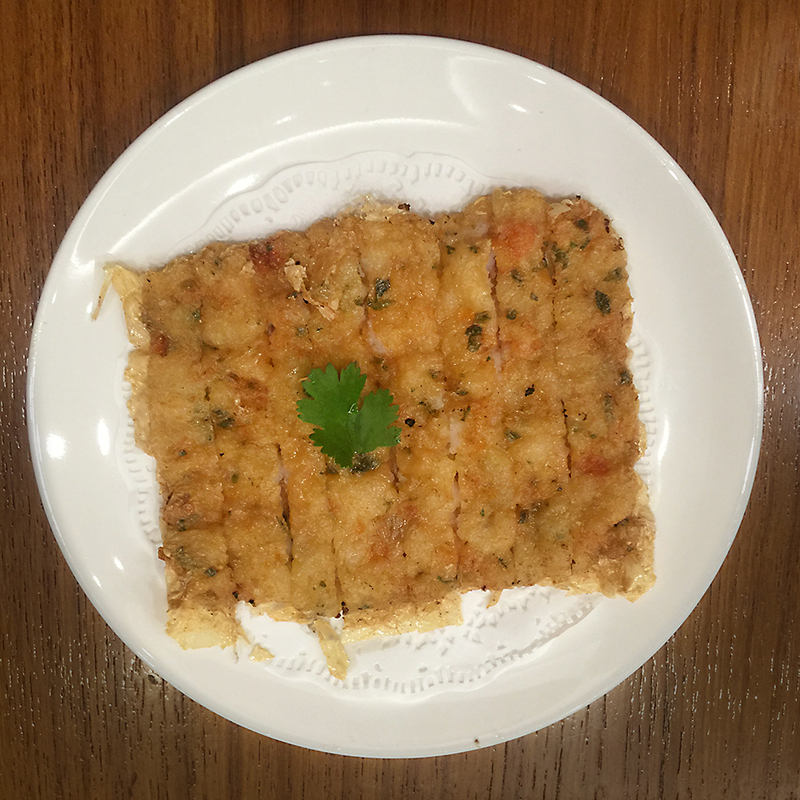 The shrimp pancake from Din Tai Fung had many plump shrimp that snapped on bite all held together with an omelette type mixture. So good. So you are full from too many delicious bites? Or maybe you need something to fill the time before your next treat. 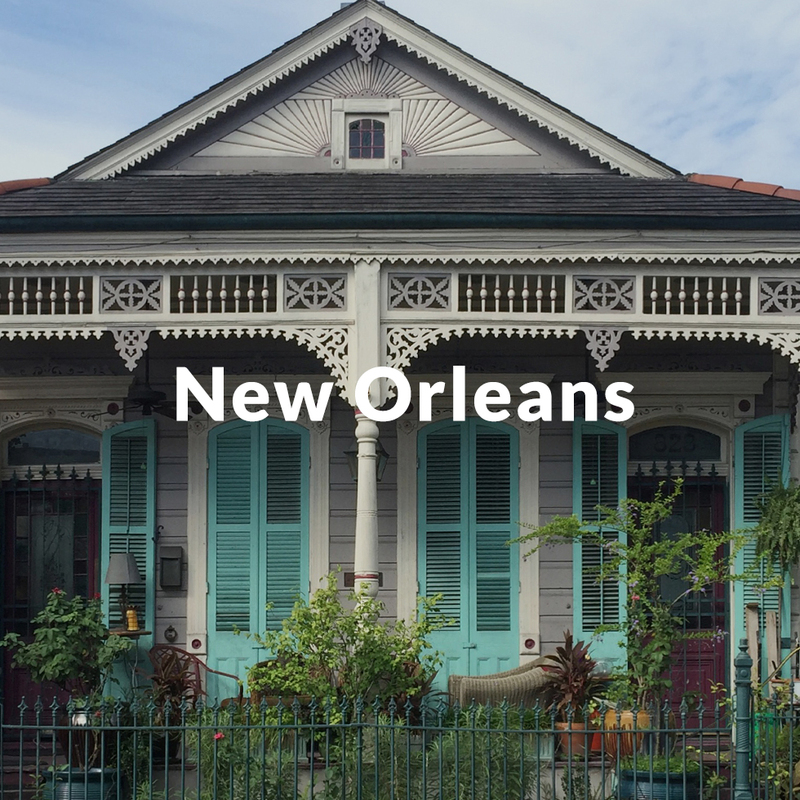 Either way these are some great ideas for stops while in town. 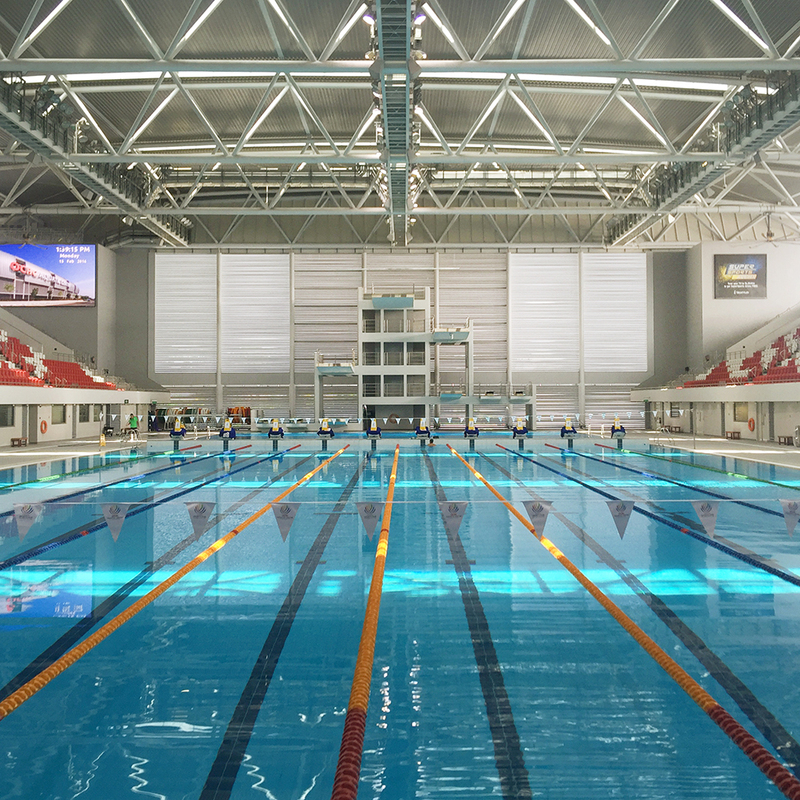 This is the best olympic pool I have ever taken a swim in. Each visit cost just under two US dollars and the pool never had more than one person per lane. On my last visit I had the whole thing to myself. Chinatown is packed with shops, restaurants, temples and the newly opened Chinatown Food Street. It all makes for a nice walk with the promise of street eats. 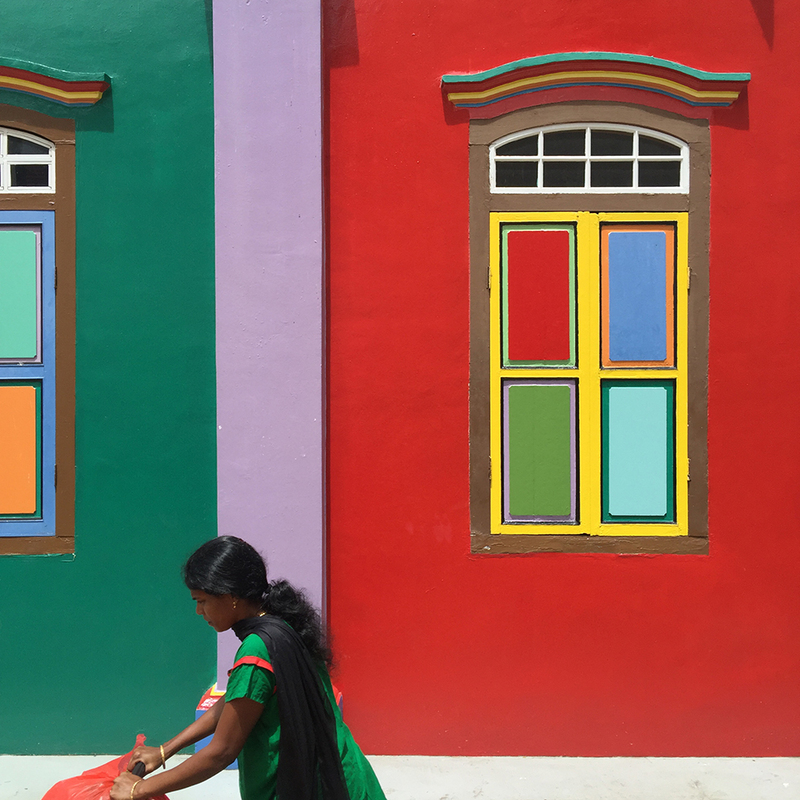 Little India is a bright and hopping slice of it's namesake country. 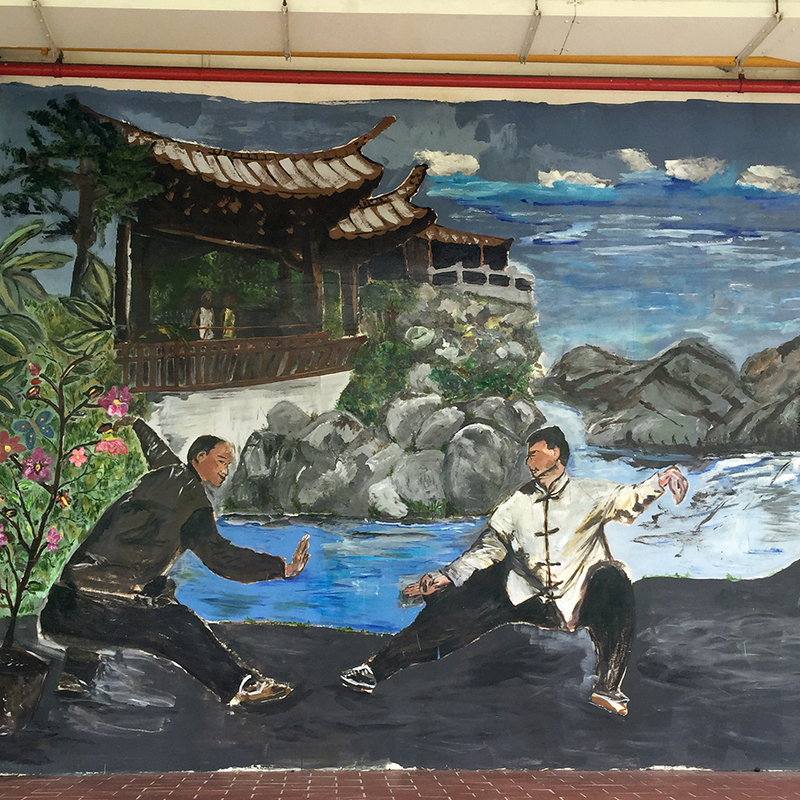 It was cool to cruise through and end up hungry at the Tekka Hawker Centre. 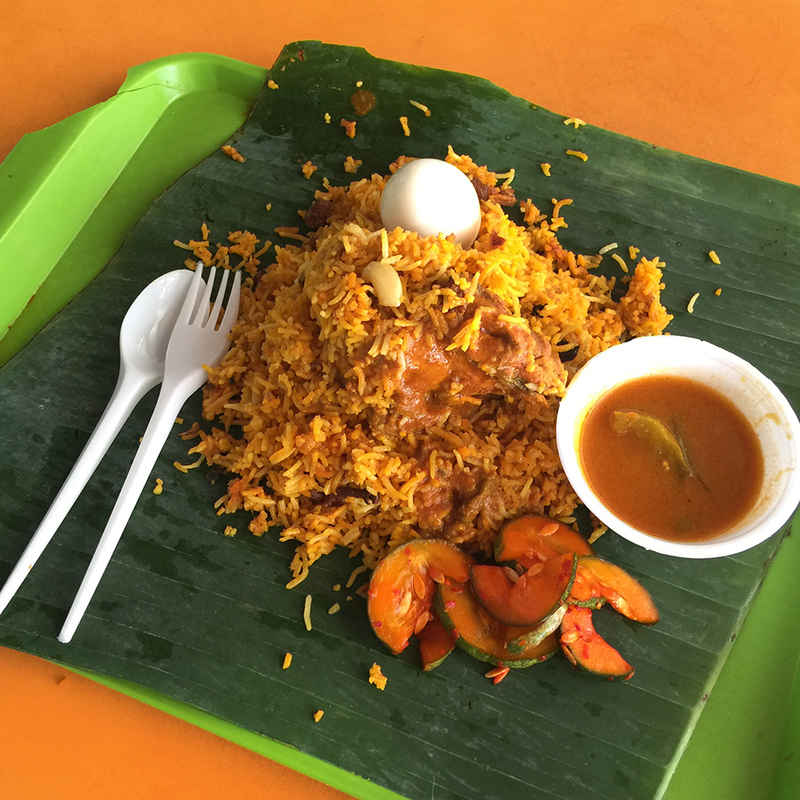 On my visit to Tekka I had a lovely chicken biryani and prawn mee. 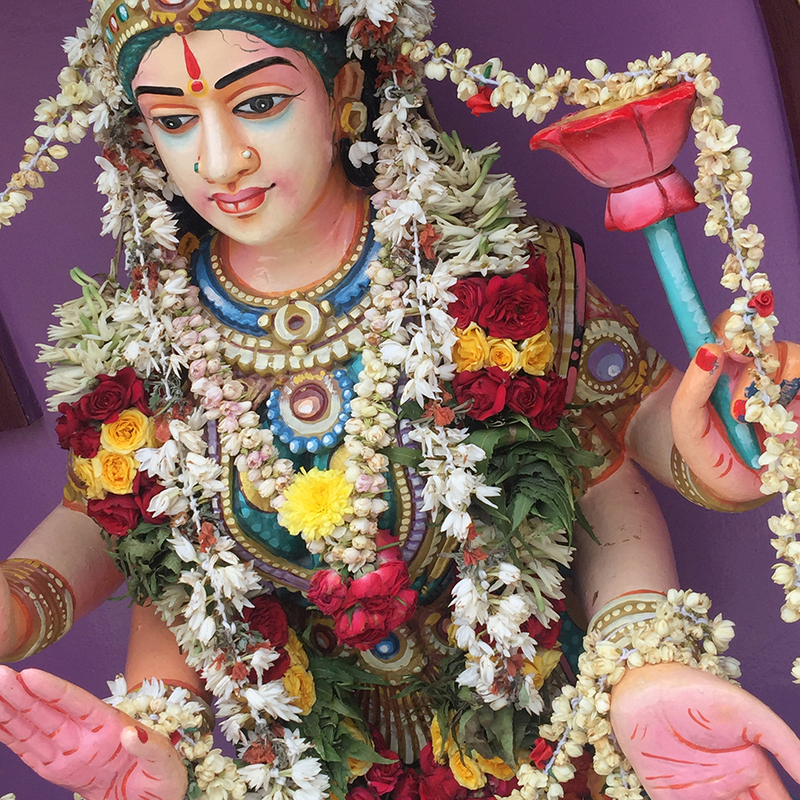 Sri Senpaga Vinayagar Temple is located right next to 328 Katong Laksa. So grab a bowl of laksa first then take a quick peek at this bright and super ornate temple dedicated to the Hindu God Genesha. 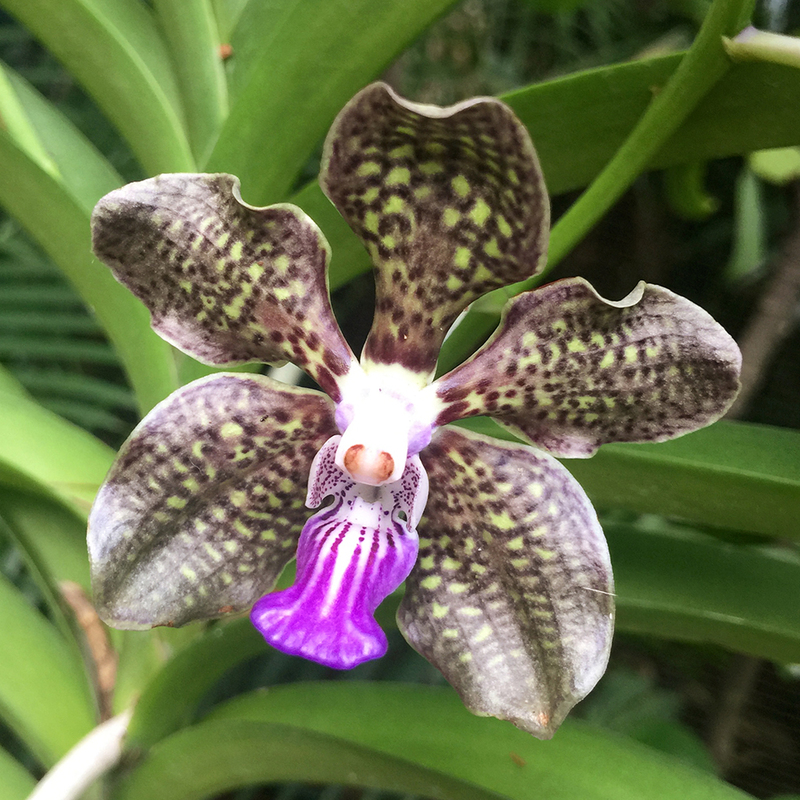 After a great breakfast from Selera Rasa I went to The Singapore Botanic Garden to walk off a bit of it. It's a free, super lush park with ponds, landscapes and a couple reptiles. Bring an umbrella for the sun ... it may also rain or sprinkle. 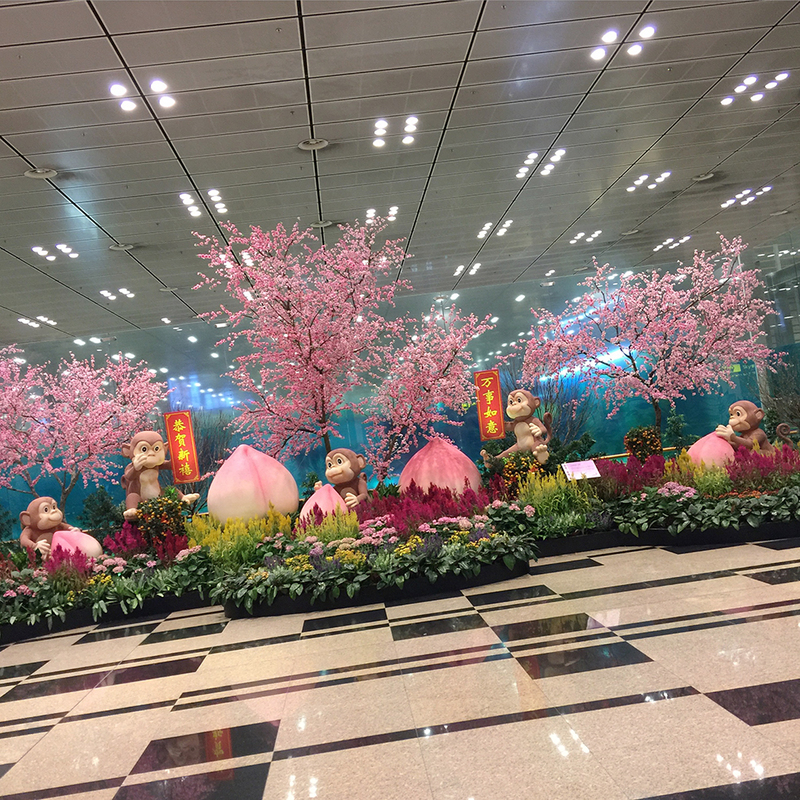 Changi Airport offers a huge range of services, shopping, entertainment and various other cool ways to burn time. Maybe more than any other airport in the world. My flight was at some predawn hour so all I really got to enjoy was a few snacks before boarding. 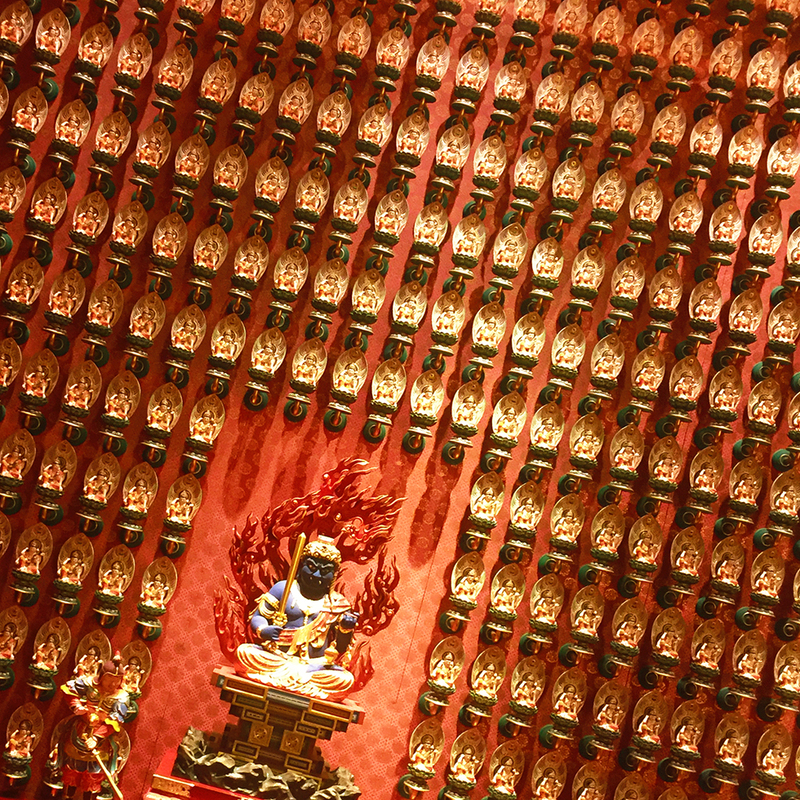 Buddha Tooth Relic Temple is a newer Buddhist temple located in Chinatown. I cruised through to have a look at the construction and to bow in front of Vairocana Buddha which is the guardian deity for those born in the year of the monkey or goat. 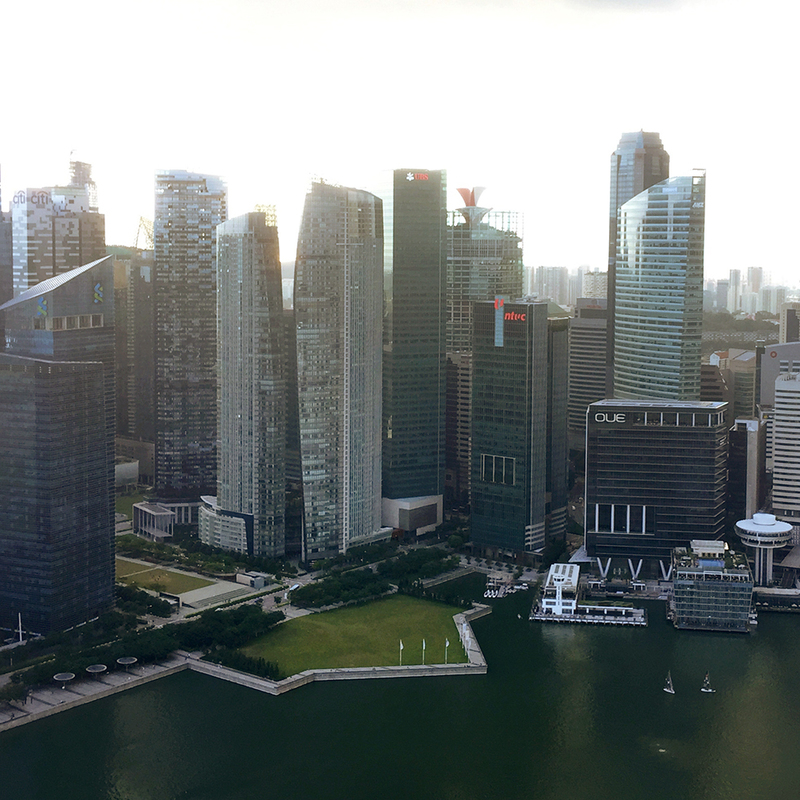 Probably the best view of downtown Singapore. The three tower complex looms large over the bay and Singapore strait. The martini I ordered gave plenty of time to breathe it all in.